(Seattle, Wash.; June 23, 2010) – Jensen Maritime Consultants, Inc., a Crowley company, recently completed plans for modifications to the dredge Potter, which supports dredging efforts for the U.S. Army Corps of Engineers (USACE), St. Louis District. The design modifications included removing the existing upper deckhouse and pilothouse areas and replacing them with a new fully outfitted set and adding a new deckhouse in the aft end. Gulf Island Fabrication, Inc., Houma, La., was awarded the construction contract. The 240-foot Potter was originally constructed in 1932 of all-riveted steel. Numerous repairs and modifications have been made to the vessel over the years, particularly to the hull structure. The vessel was re-powered in 2000 from steam to diesel-electric power. 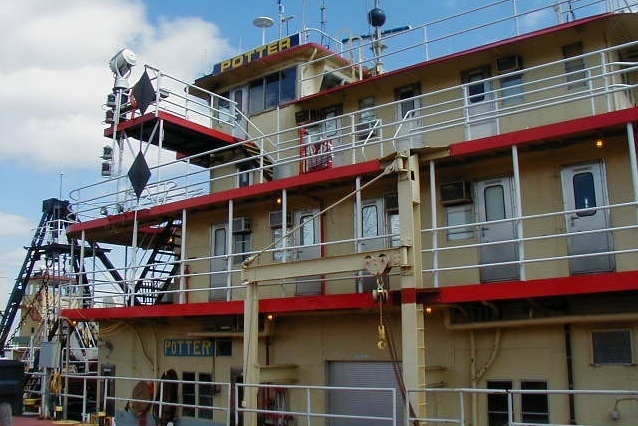 The vessel performs dredging missions along the Mississippi River and its tributaries, between Saverton Lock and Dam No. 22 on the Upper Mississippi River up to the Missouri River, Illinois River and Ohio River Lock and Dam No. 52. The vessel is also available to perform emergency dredging operations as far south as Helena, Ark. Jensen Maritime Consultants, Inc. is a naval architecture and marine engineering firm located in Seattle that offers a diverse range of services developed from experience around the world. Jensen, formerly B.F. Jensen & Associates, has been a recognized leader in the design of all types of vessels for over 40 years, including workboats and passenger and fishing vessels. The company’s excellent reputation is built on a long history of successful designs and conversions with close attention to engineering basics. Jensen’s international on-site consulting services can provide customers with assistance anywhere in the world.